Double bunk beds make this a fun travel trailer, so invite some friends for a weekend getaway! 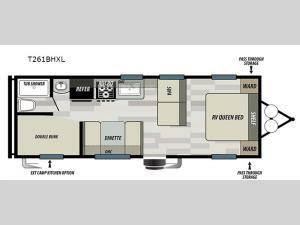 You'll find an RV queen bed at the front of the unit for a comfortable night's rest. The sofa and booth dinette provide seating for everyone and at night, these can convert to sleeping space, which allows this unit to sleep eight people! The private shower/tub and toilet allow someone to shower, while the vanity right outside the bath allows the kids to brush their teeth before bed. Whip up dinner on the three burner cooktop or pop some popcorn in the microwave for a quick snack. This travel trailer also includes a pass through storage for all your large camping gear!